The S&P500 crashed under 2,700 support Tuesday following a political flare-up in Italy. A populist movement is taking hold that threatens Italy’s membership in the EU and common currency and these headlines were enough to send global markets into a tailspin. Losing one of the largest economies in the EU and euro could be a fatal blow to entire union. These headlines echo Grexit and Brexit of years past. While both of those past episodes avoided the worst, it isn’t hard to imagine the economic devastation a collapsing EU would cause and is why markets are understandably jittery. Owning stocks is risky. There is no way around it. Last week the stock market was acting well and even negative headlines surrounding rate hikes, interest rates, trade wars, and North Korean tensions couldn’t dent this teflon market. But the thing about all of those headlines is they had been in the news for months and were largely priced in. Anyone who feared those stories bailed out months ago and were replaced by confident dip buyers who demonstrated a willingness to hold these risks. After a period of turnover, we ran out of fearful sellers and recycling old headlines stopped bothering the market. When no one is left to sell a headline, it stops mattering. There are few things more bullish than a market that refuses to go down on bad news. And that is where we finished last week. But that was then and this is now. These Italian headlines are new and unexpected. Few saw this coming and if the crowd doesn’t know about something, then by rule it cannot be priced in. That is what makes these Italian headlines a far more serious threat to stock prices than rate hikes, interest rates, trade wars, and North Korean summits. Sometimes we can ignore the news, other times we need to snap to attention and take them seriously. These new and unexpected Italian headlines most definitely deserve our full attention. While Italy’s departure from the EU would most definitely be disruptive, this is a binary, black swan event. Either it happens or it doesn’t, and the chances of it happening are extremely remote. We saw similar episodes play out with Greece earlier in the decade. The ramifications of a Grexit were frightening, but the risks were so great that political leadership in Europe ensured it didn’t happen. And what could have been a catastrophe turned into a fantastically profitable dip buying opportunity. No doubt most money managers remember the fear mongering surrounding the Grexit and Brexit. And most money managers also remember selling that fear and uncertainty was a big mistake. Just like the boy who cried wolf too many times lost his credibility, I expect the same to happen here. The typical reaction on Wall Street will be “not this again” and most will discount it as another EU drama that ultimately isn’t worth worrying about. These new and unexpected events usually take at least a few days to work their way through the system and we should expect headlines to flare-up over the next few weeks. But as bad as the worst case sounds, I expect most money managers will be more confident sitting through this uncertainty than they were during the Grexit and Brexit episodes. We could see further near-term weakness, but I don’t expect this to go too far and any dip is still buyable. This will be more of a blip than a crash. There is no reason to abandon medium and long-term positions, but a short-term trader could wait for things to get a little worse before jumping in and buying the dip. Of course the above assessment assumes Italy doesn’t destroy the EU. All bets are off if this situation escalates to the point of no return. But we are most definitely not there yet. I still think this market looks good, but I would let this situation play out for a few days before rushing in and buying the dip. Is this market being manipulated? The S&P500 started Thursday with another abysmal gap lower. Trump called off his scheduled meeting with Kim Jong Un before the open and that sent stock futures into a tailspin. That mirrored Wednesday’s horrible open following a flareup of Trump’s trade war. Consecutive days of bearish headlines followed by horrid opens, can it get any worse? As bad as we started, the S&P500 is actually ABOVE Tuesday’s close! How could two horrible days end in gains for the index? No wonder so many people feel like the market is “rigged”. When the market doesn’t do what we think it should, obviously the only plausible explanation is someone is manipulating it. Of course that is far from the truth. There is there is no evil wizard hiding behind the scenes tricking and deceiving us. People who think the market is fixed simply don’t understand why it is doing what it is doing. There is no trickery. There is no boogie man. It is nothing more insidious than a simple misunderstanding. When humans didn’t understand why the Sun came up every day, they assumed is was being controlled by the Gods. The same logic occurs in the stock market today. When people don’t understand why the market does something, they blame it on some evil conspiracy that has rigged the market against them. It couldn’t possibly be that their analysis is flawed. Luckily for regular readers of this blog, most of us understand what is going on and were not fooled by these bearish headlines and weak opens. As I’ve been saying for a while, this market is strong, not weak. There have been plenty of bearish headlines swirling around this market for months. Yet this market is consistently oblivious to them. Bears claimed it is only time before the “sheep” wake up and send stock prices tumbling. But the critical flaw in the Bear thesis is market selloffs are brutally quick. They happen so rapidly most people don’t have to react. Yet here we are, holding 2,700 support for two full weeks. What selloff gives us two weeks of warning before plunging? None. That’s how I knew the last two weak opens were not sustainable and were bound to bounce. If we were going to crash, it would have happened a long time ago. This market is strong, not weak. That meant recycling trade war and North Korean headlines were not going to make any more of a difference than the first time they occurred. Everyone knows markets move up and down. This is one of the most fundamental principles of the stock market and it is plainly obvious to anyone who glances at a stock chart. We all know stocks mostly go sideways and most of the ups and downs don’t really mean anything. Yet most people forget this most basic concept in the heat of battle. If most day’s gyrations are meaningless noise, why do we always try to find a meaning in today’s price-action? Why do we automatically assume today’s bump in the road is the start of the next big move when most bumps in the road never go anywhere? With the benefit of hindsight, we can confidently say Wednesday’s and Thursday’s gap lower opens were nothing more than meaningless noise driven by a handful of reactive traders trying to “get out before things get worse”. Their impulsive selling was clearly a mistake and just a few hours later they are poorer for it. As I’ve said countless times before, this is a strong market, not a weak one. If we were going to crash, it would have happened by now. While the path of least resistance is most definitely higher, the easy gains are behind us. There is no way we could keep the sharp rebound from May’s bottom going indefinitely. We knew a cooldown and consolidation was inevitable. We also know gains slow down the further into a move we get. Applying that to this market, it seems pretty obvious that prices want to go higher, but that we should expect the rate of gains to slow down and for there to be more back and forth. And guess what? That’s exactly what’s happened. Those of us that were paying attention during May’s dip and rebound have collected our fast money. But that trade has come and gone. Now we are into the slow money portion of the rebound and should expect the gains to accumulate much slower and be accompanied by a bunch of back and forth. Those of us that believe in this market should stick with our buy-and-hold positions and enjoy this slow glide higher. Anyone who has less conviction should simply sit this one out and wait for a better trading opportunity. Without the conviction to sit through dips like Wednesday and Thursday, that inevitably leads to reactive selling and poorly timed trades. FAANG stocks are acting well and these tech highfliers will continue leading this market higher. But just like the broad market, we should expect the rate of gains to slow down as we fall into the slow summer sessions. Bitcoin still looks broken. $9k support two weeks ago gave way to $8k support last week, which has since given way to S7k support here. Hopefully everyone sees the pattern here. We are in a bear market and the downtrend is still alive and well. Expect prices to undercut the $6k lows over coming weeks. This bubble isn’t done bursting and that means lower-lows are ahead of us. What should we make of today’s reversal? 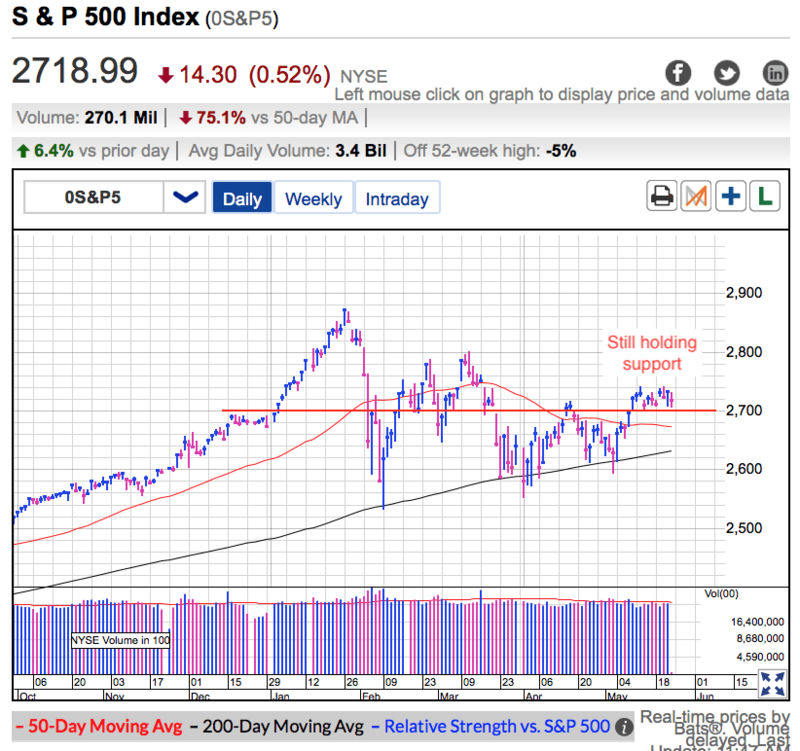 The S&P500 started Tuesday with modest gains, putting us near the highest levels since March, but a late selloff pushed the market firmly into the red. The question is if today’s bearish reversal means anything, or if this is just more meaningless noise tricking over-active traders into making poorly timed trades. Headlines have been relatively benign, allowing stocks to remain above 2,700 for nearly two-weeks. There has been some back-and-forth regarding Chinese tariffs, but to this point we seem to be avoiding a larger trade war. As expected, there have been some small bumps along the way. One day a positive development pushes us up 10-points. The next day a hiccup sends us tumbling 10-points. But so far last month’s resistance has turned into this month’s support. Holding 2,700 this long is encouraging. Stocks tumble from unsustainable levels quickly. Maintain these levels for nearly two-weeks tells us we are standing on solid ground. There have been more than enough unnerving headlines and weak price-action to send us tumbling, but confident owners refuse to sell and that is keeping supply tight. We’ve seen several dramatic dips over the last few months, largely driven by uncertainty surrounding Fed rate-hikes, rising interest rates, a looming trade war, and a potential scandal in the White House. 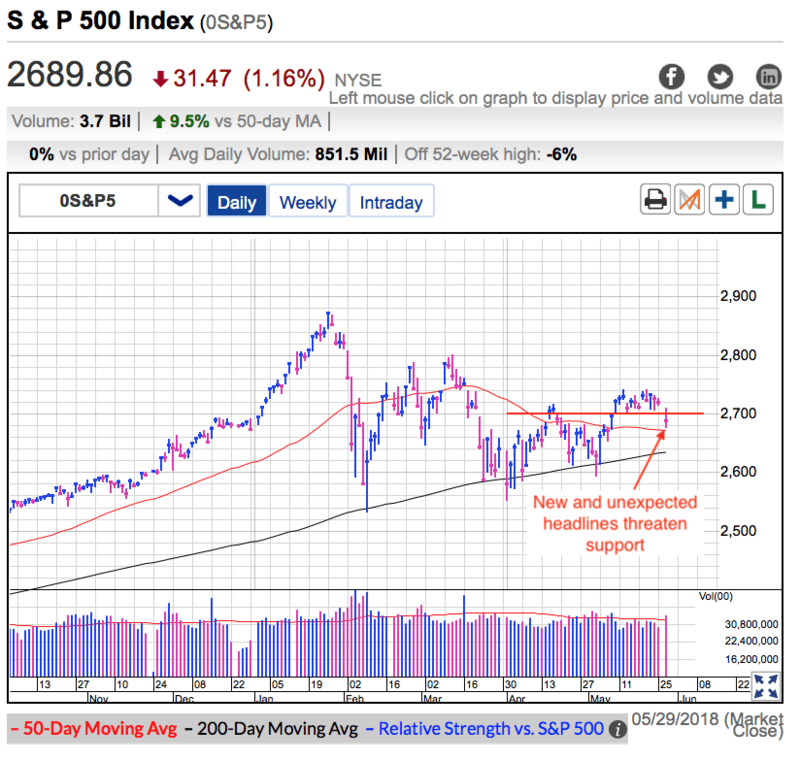 While this uncertainty has created some near-term volatility, prices haven’t undercut February’s lows and this price-action looks more like basing and consolidating last year’s gains than standing on the precipice of another plunge lower. As I’ve been saying for months, if this market was fragile and vulnerable, we would have plunged a long time ago. This resilience against a larger selloff tells us this market is strong, not weak. I’ve been encouraging readers to buy the dips over the last few months and that lead to some very profitable trades. But now that we are at the upper end of the trading range, should we be concerned about another dip? Two-weeks ago I was cautious and told readers the easy gains were behind us and that was a better place to be taking profits than adding new positions. As so far that has been wise advice since we have been trading sideways ever since. The sharp gains from the May lows made us vulnerable to a dip and the risk/reward was skewed against putting new money in stocks. But two-weeks later and the picture is shifting. 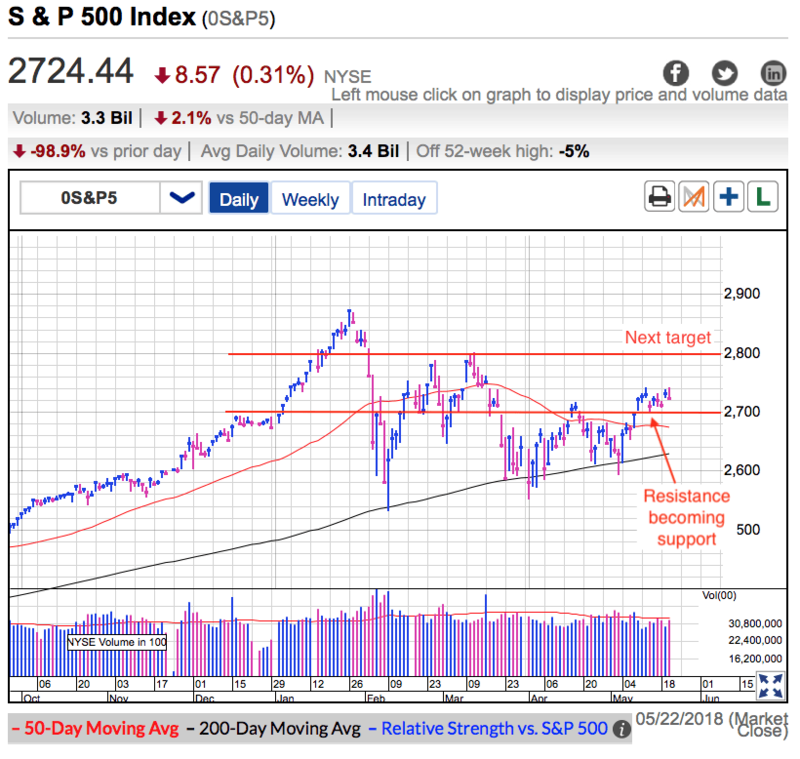 The market resisted dipping back into the trading range and is holding up quite nicely despite the headline headwinds. That tells me the path of least resistance is still higher. Unfortunately the easy gains are behind us. The best profit opportunities come during the scariest moments. Now that the fear and uncertainty has passed, the discounts have disappeared. Even though the market is acting well and the path of least resistance is higher, further gains are going to be harder and slower. It took little more than a week to bounce more than 100-points from May’s lows, but it could take all summer to rally the next 100-points. The best short-term opportunities arise from emotional overreactions. Unfortunately this calm isn’t giving us much to trade. But just because we don’t have a short-term trade in front of us doesn’t mean we cannot make money. The path of least resistance is higher the best slow-money trade is buying-and-holding these near-term gyrations. The market is acting well and don’t let the bears scare you out of good positions. If this market was fragile and vulnerable, we would have crashed a lot time ago. The tech trade is alive and well. Most of the FAANG stocks are near all-time highs and even GOOGL is well off its lows. I told subscribers weeks ago that people would be kicking themselves for not buying the tech dip and no doubt that is what a lot of people are doing. It is human nature to beg for pullbacks so we can jump aboard the hottest trades, yet when the pullback happens, those same people are too afraid to jump in. Even though the easy profits are behind us, the Tech Darlings are acting well and will lead this market higher. But just like the broad market, further gains will be hard and slow. The path of least resistance is higher and smart money is still sticking with these stocks. Bitcoin is a completely different story. Last week’s $9k support has turned into this week’s $8k support. And thus far it is giving every indication that $7k will become next week’s support. I hope you see the trend here. Cryptocurrencies are still very much in a downtrend and we should expect lower prices. It takes most bubbles between 6 and 24 months to finish bursting. If bitcoin is like most bubbles, that means the worst is still ahead of us and we should expect lower-lows over the next few months. If you found this post useful, return the favor by sharing it on Twitter, Reddit, and Facebook!